Valeria Valentina Bolívar is a director, scriptwriter and producer originally from Venezuela who currently lives in the Dominican Republic. Her passion is telling stories through images and sounds — stories that move the heart, body and soul. 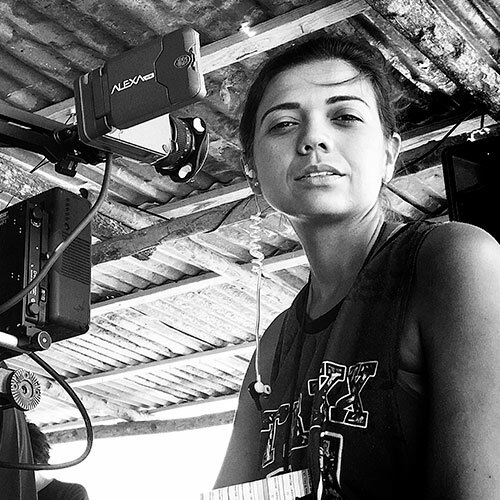 She has worked as an assistant director on important Venezuelan films, such as Azul y no tan rosa (2012) and Pelo malo (2013). In 2011, she studied film staging at the International School of Film and Television (EICTV) in San Antonio de los Baños, Cuba. Her short film Extraños (2013) took part in national and international festivals and was screened in 2015 in movie theaters in Venezuela. In 2013, Valeria founded the production company Producciones Petanina, now based in Santo Domingo. Her latest short film, El niño, premiered at the Montreal World Film Festival and is still touring the international festival circuit. Valeria is currently developing her first feature film, En su piel. En su piel [co-written with Inti Torres] — Joaquín is schizophrenic, lives practically self-marginalized and Marcela is the only person with whom he relates. After losing his job, the window of his house is his only contact with the outside world. From there, Joaquín sees a homeless person and becomes obsessed with him until he becomes the reflection of his own obsession.